Here are some nifty charts showing various statistics from my SNA visits and the SNA program itself. A great, though late start in 2009 was followed by a bonkers 2010. Then we had a little addition to the family which understandably deserved more time and attention. Slighty fewer new visits in 2012 because that little addition became mobile and 2013 was a bit of an upswing. 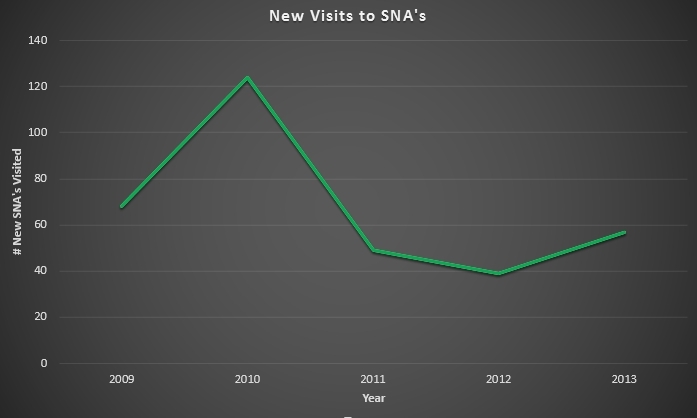 In the total number of my new SNA visits, the last few years have seen a relatively stable slope. 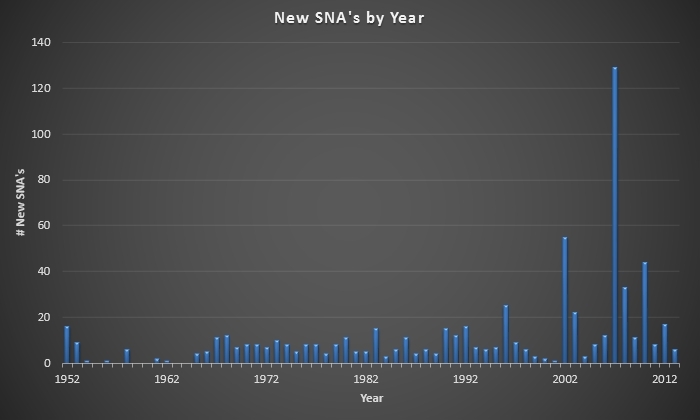 In most years, less than 20 new SNA’s were added, but there have been some exceptions, notably the 129 new SNA’s in 2007. Recent years have been a return to normalcy. Though properties are removed from the SNA program now and then, the general trend is positive.